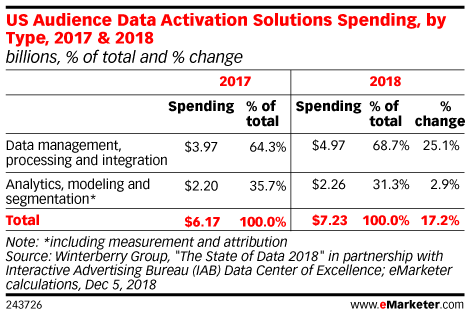 Data is from the December 2018 Winterberry Group report titled "The State of Data 2018" in partnership with Interactive Advertising Bureau (IAB) Data Center of Excellence. Findings in the report are based on the aggregation of publicly availabile financial information on data product investments, public company revenues and associated financial dynamics as well as dozens of in-depth interviews with senior-level marketers and practitioners representing a wide range of data, marketing service and technology providers operating in the US market. US audience data market includes spending on data assets licensed from third-party providers, as well as service and technology-oriented offerings that support the use of audience data for US marketing and advertising purposes. This includes commercially-licensable data and/or audience segments and any third-party solution supporting the collection, management, segmentation, analysis and/or deployment of audience data. Excluded are "insourced" data-related investments, including spending on talent and development of homegrown technologies, data-related spending that support market research and other aggregate insights rather than campaign-orientated marketing and spending that are directed principally to enterprise priorities other than advertising, marketing or media.